Stomatopod crustaceans, or mantis shrimp, are best know for two things: their elaborate and complex compound eyes and their ultra-fast, ballistic strike. For a fun explanation of these stomatopod features, check out my stand-up comedy set HERE. I’m currently investigating how these two systems are related. Specifically, which features of the visual system influence the decision to target and release the spring-loaded strike? And what are the neural controls of the strike? I started this research as a Marie Sklodowska-Curie Fellow at the University of Cambridge and am continuing to use the sophisticated techniques found in the Fly Systems Laboratory (led by Dr. Paloma Gonzalez-Bellido) in our new home at the University of Minnesota. These techniques include high-speed video recording and analysis, electrophysiology, and neural cell labeling and tracing. Stay tuned for exciting results from this new line of research! Have you ever wondered how other animals use their eyes to see the world; why animals are such interesting colors; or the role light plays in the evolution of animal traits? As a visual ecologist, I regularly ponder such questions and look to the natural world for answers. As a visual ecologist, I’ve spent a lot of time investigating light and the biology of stomatopod larvae, or babies. Though at first glance stomatopod larvae may appear to be less developed versions of the wildly interesting and complex adults, larvae are in fact adapted for a very different life style. Larvae spend their entire time in the open ocean as zooplankton, whereas the adult phase is spent almost exclusively on the sea floor. Not surprisingly, larvae evolved a different type of eye to cope with their environment. My previous work characterizes the type of light different species of larvae can detect (Feller & Cronin, 2016) as well as the unusual metamorphosis stomatopod eyes undergo as they transition from the larval to the adult structures (Feller et al. 2014). This system provides an interesting look at how different light environments and visual behaviours shape the function and evolution of eyes in a single animal. IN ADDITION: Stomatopod larvae are also masters of disguise! Their glass-like bodies are almost completely transparent to light, making them nearly invisible to predators as they swim through the open water. Unfortunately, their eyes can never achieve this level of transparency without compromising their function. Stomatopod larvae, as a result, have landed on an elegant camouflage solution that does not affect a larva’s ability to see (Feller & Cronin, 2014). 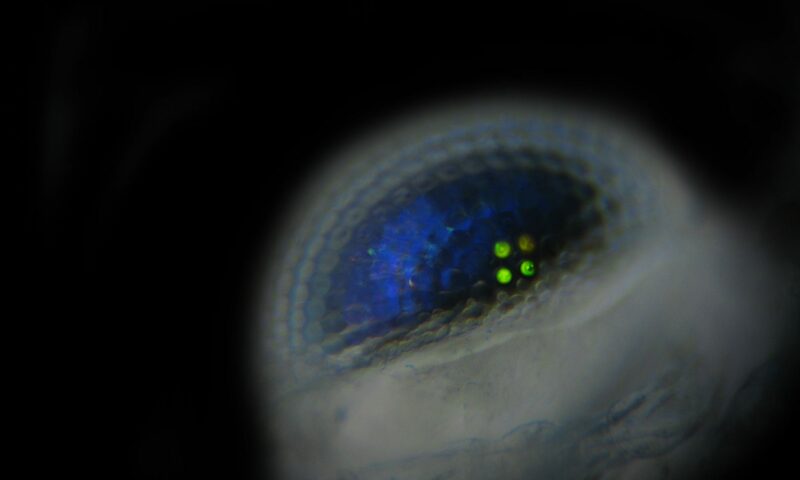 Unique photonic structures in the eyes are responsible for producing glittery eyeshine camouflage as well as other weird and interesting features (Feller et al, coming soon!). For a more entertaining description of this discovery, watch my 3-MINUTE FameLab PRESENTATION, which won the Cambridge regional finals in March 2017! One of the burdens of choosing to study crustacean larvae is that very few morphological descriptions exist for identifying a species during the larval phase of life. I have circumvented the issues surrounding identification of the individuals I study using DNA barcoding, a molecular technique that uses a specific DNA sequence as a barcode, or a fingerprint, that connects an unknown individual to its described species. This necessary component of my research facilitates a tangential line of my research that aims to ameliorate the current deficiency in stomatopod larval identification methods (Feller et al. 2013). I continue to work with my collaborators to produce morphological descriptions and molecular analyses of stomtopods and other taxa (Davis et al. 2014; Geheber et al. 2016) as well as to incorporate these large DNA barcode datasets into population studies for conservation biology (Palecanda & Feller et al, in preparation). My DISSERTATION DEFENSE SEMINARY provides a detailed audio/visual summary of my research – recorded as a live broadcast on Youtube to make accessible to a larger audience.